When the weather heats up, there’s something about water activities that appeal to us. Maybe it’s the fresh, cool fun of splashing through Lake Nantahala. Maybe it’s a desire to relax. Maybe it’s our sense of adventure wanting to explore terrain that’s been barred to us during the winter. 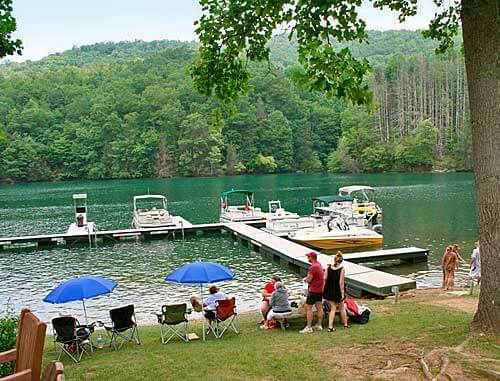 The good news is, whatever your reasons for loving water activities at Lake Nantahala, we’ve got you covered with plenty of options. Here’s how you can have fun in the sun and surf this summer. Want to lounge on the water with lunch and an ice cold drink? Lake’s End Marina makes boat renting simple. 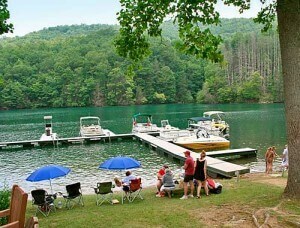 Rent a boat for Lake Nantahala cruising and get started on that summer vacation feel. You can enjoy the sunshine in a pontoon, deck boat, fishing boat, or a canoe. The marina rents by half days and full days, so you can enjoy the open water for as long as you can entertain yourself. Bringing kids along? Want to take a break and act like a kid yourself? Gather some friends together and rent a tube for your day on the lake! Make a memory on those still, fog-laced mornings of spring and summer. Teach your spouse, kids, or grandkids to fish the crystal clear waters of Lake Nantahala. Our waters are brimming with freshwater fish and secluded spots to relax with your line. Just avoid the endangered species! Is your sense of adventure telling you to get moving? Then pack up the car and head to the Nantahala Gorge for a day! Our friends in Bryson City have the scoop on rafting lessons, whitewater boating, and guided tours down the Nantahala River. They’ll keep you safe, happy, and having a blast while you satisfy your inner adventurer. Want to learn more about North Carolina mountain lake exploration? Call Reflection Lake Nantahala today.